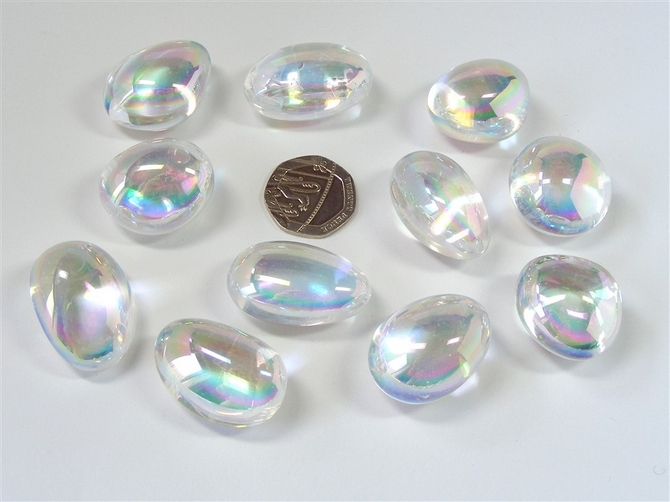 Lovely, lovely tumblestones of Angel Aura Quartz with their interplay of pale pink, light blue, green, lavender and yellow which change colour when moved or held in the light. 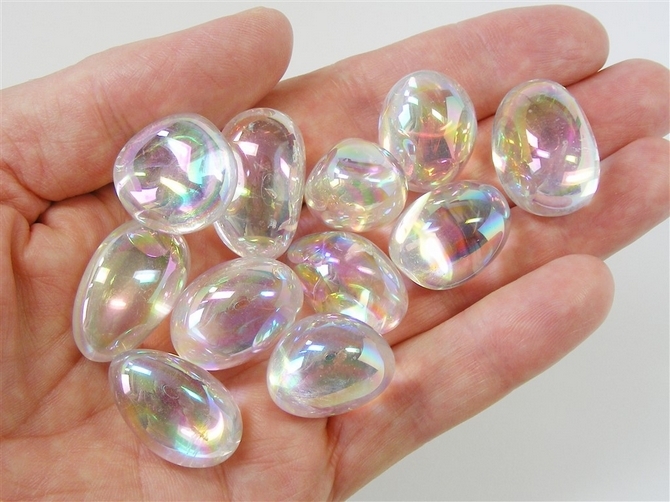 Angel Aura Quartz is sometimes also called Opal Aura Quartz. These are Quartz tumblestones that have been treated with both Platinum and Silver with a process that permanently bond the precious metals to the Quartz. It will not rub off or wash off. These are all really top quality, nice sized, pieces with a good amount of "aura" on them. This is a great stone to work with and it has a great feel to it ! Angel Aura Quartz (also known as Opal Aura Quartz) is clear Quartz that has been treated with Platinum and Silver to create its wonderful silvery surface with splashes of iridescent colour. It is said to help with stress-related illnesses. Angel Aura is a delicately uplifting stone bringing us a sense of joy and happiness. It helps to lift our mood and clear our mind of unwanted distractions. Angel Aura stimulates within us the higher feelings of love, empathy, nurturing, peace and harmony. Angel Aura helps us to raise our levels of consciousness to that of the Angelic realms, bringing us a sense of inner peace and calmness to our overall being. It helps us to better contact and communicate with those beings in the higher realms, with our Angels, with our own spirit guides and with our teachers. Angel Aura helps us in gaining access to the Akashic records and in channeling higher knowledge. It also helps us to remember our past lives and incarnations and gives us an insight into our own spiritual purpose in this life. Angel Aura works predominantly on the crown chakra but can also stimulate and clear each of the other chakra energy centres too. It is an excellent protector of our own auric field which it cleanses, soothes and heals and then boosts with protective energy for us.